Cebu Pacific Promo Fares 2019 to 2020: New Seat Sale Now! 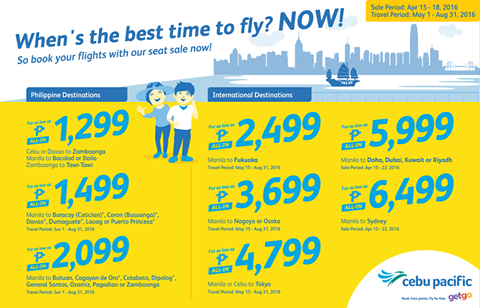 Cebu Pacific Promo Fare 2016: Seize the day & go on your next adventure with the new seat sale! Book now till April 18! When's the best time to fly? NOW! Of course! Yo have more reasons to visit Cagayan de Oro, Cotabato, Dipolog, General Santos, Ozamiz, Pagadian or Zamboanga. Or visit Iloilo or Tawi-Tawi. So what are you waiting now? 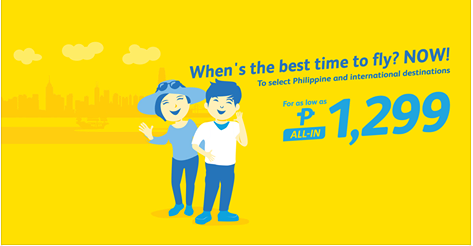 Take advantage of promotion from Cebu Pacific! how can i avail this promo from manila to zamboanga? how can i get cheap flight to iloilo? Yes to YOLO! Book Now! We Got A New Facebook Account! Promo Fare 2016 is Php 599 only! Cheapest Fare of Php 999 Out this Summer!